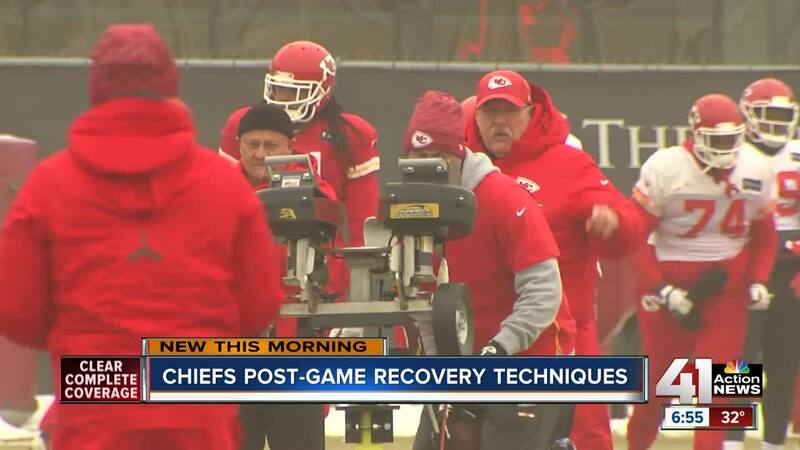 Yoga, massage therapy and hot tubs are all options to help Kansas City Chiefs players recover as they prepare for Sunday’s AFC Championship game versus the New England Patriots. OVERLAND PARK, Kan. — Yoga, massage therapy and hot tubs are all options to help Kansas City Chiefs players recover as they prepare for Sunday’s AFC Championship game versus the New England Patriots. An athletic trainer with University of Kansas Health System’s Sports Medicine Department interned with the Chiefs during the 2013 season. Now, Ryan Sloop is the trainer at Shawnee Mission West High School. KU Health System is the official healthcare provider of the Chiefs. Sloop said a lot of the strategies the Chiefs use to recover and stay healthy for a long season apply to high school and adult athletes. Stretching, giving attention to injuries, sleep, and nutrition apply across the board. There is one difference in the NFL. “They have everything at their disposal. Money is not an issue. They can provide the absolute best,” Sloop said. He pointed out every player in the NFL is an elite-caliber athlete who must make it a full-time job to take care of their bodies. He stressed the importance of building muscle during the off season to put them in position to succeed during the months-long season and playoffs. Sloop said the Chiefs have an edge over the Patriots in terms of recovery because they last played on Saturday, whereas the Patriots played Sunday. “It was critical they played on Saturday. They even got an extra day of rest, an extra day of recovery. I think that will be huge, that's an advantage. Not only that, they're playing at home in front of the raucous Arrowhead crowd,” Sloop, a lifelong Chiefs fan, said. Routine is something the Chiefs take seriously. Every day of the week has the same schedule during the season. Sloop said that same strategy can help casual athletes stay in shape and avoid injury. The game is Sunday at 5:40 p.m.